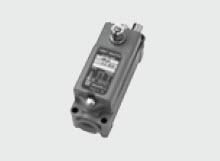 Motors rated for use in hazardous locations. Single phase models provide for 115/208/230V in one unit, and 208/230/460V three phase in another unit. Requires addition of monitored external entrapment device to operate with momentary contact in the close direction. Allows door operation from control panel during installation and service. Visual indicators allow for easy configuration and service of operator. Provides overrun adjustment from the lower limit to fine tune the door seal to the floor. 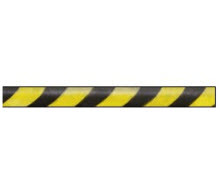 RHX® Explosion-Proof operators are Factory Mutual approved for use in hazardous areas in the United States and Canada. Sectional Doors: Standard, side mount, and dual trolley applications. All models come standard with a dynamic brake system. 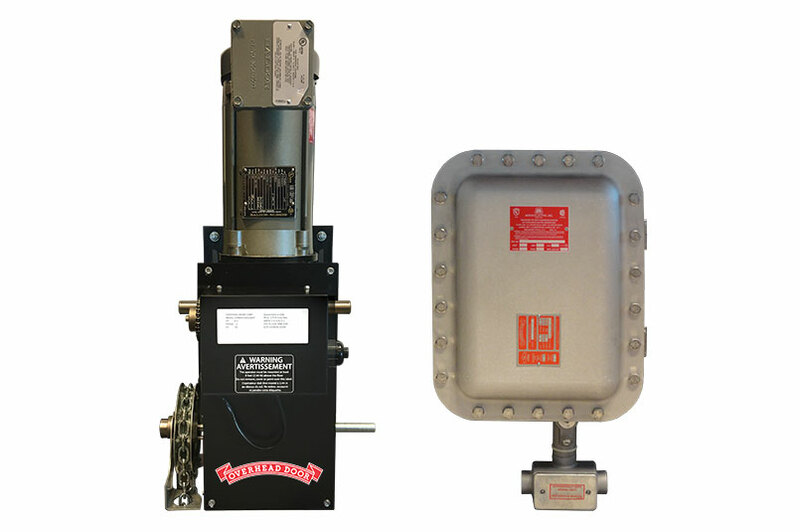 Side-mount and center-mount chain couple or direct couple to the door shaft with hoist. Hoist models are left or right hand adjustable in the field. Rolling Steel Doors: With hoist, front of hood, top of hood, bench mount, and wall-mount applications. Hoist models are left or right hand adjustable in the field. Hazardous area rated motor standard. Hoist unit motors available in ½ horsepower single phase, 1 horsepower three phase and 3 horsepower three phase. Trolley models available in ½ horsepower single phase, and 1 horsepower three phase configurations. Doors can be set to automatically close after an elapsed timer expires. Delay can be adjusted from two seconds to four minutes. Operator shuts down automatically when running time exceeds the time required to run between the limits plus five seconds. Adjustable disc-type helps protect door and operator from major damage should the door meet an obstruction. (Included in 14 and 26 RPM direct couple mounting kits). Indicates the exact number of cycles logged for easy maintenance support. 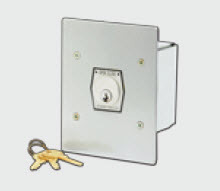 A variety of key switches are available to fit the needs of the application. Interlocks to prevent motorized operation when a door is locked. Interior and exterior push button stations available for many different configurations.